This is the 8th square of the 2018 Knitterati Gradient Lapghan. 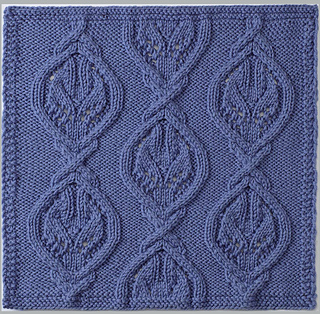 Cascade Yarns® will be making a donation to Knitted Knockers equal to the amount that it receives from Ravelry for the sale of this pattern. Knitted Knockers Support Foundation is a 501(c)(3) non-profit organization run by volunteers focusing on the free distribution of handcrafted breast prostheses (“knockers”) to women impacted by breast cancer and mastectomy. Knockers are hand knit and crocheted by volunteers, sent to Knitted Knockers, and are then distributed to cancer centers and breast cancer survivors. Your donation will help cover postage costs for Knitted Knockers to distribute the prostheses. We encourage you to visit www.knittedknockers.org to learn more about their cause. Get the patterns for the Gradient Lapghan project for FREE. Sign up early for Cascade Yarns® newsletter at www.cascadeyarns.com. Outlined cables filled with intricate details stand out over a reverse stockinette background. 20 sts x 28 rows = 4” (10 cm) over Stockinette stitch using US 7 (4.5 mm) knitting needles, blocked. Note: The coupon code will expire April 15, 2019.